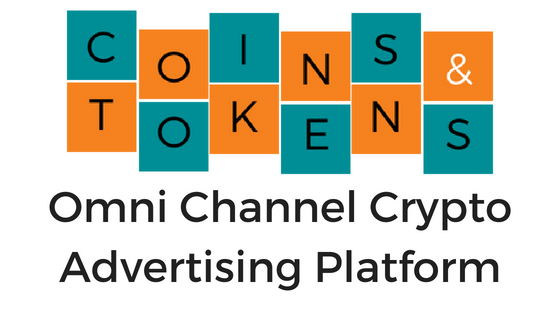 [26th July 2018, MA, US] Coins and Tokens (CNT) is an initiative by Effective Marketing LLC, having its head office in the US, to bring the best of the programmatic advertising technology to the crypto world. CNT’s proprietary programmatic technology matched with a global service footprint can help crypto companies raise investment for their blockchain based solutions through digital marketing on crypto as well as non-crypto traffic from websites and mobile apps. CNT solution is customized for early stage blockchain start-up to help raise investment through the token sale route at any stage of the ICO, be it seed, pre-sale or a public sale stage. Whether you are a crypto exchange or a product company moving to a decentralized network or just another start-up in the crypto space, the team at CNT has got you covered. CNT’s seasoned team located in the US and Asia has over 40 years of combined experience in performance-based digital advertising. CNT’s expertise in media planning and buying helps put your digital marketing dollars at work in the right direction, maximizing overall ROI from your campaigns. The team at CNT understands that the success of the blockchain based solution lies in the strength of the community that you build around your product idea and early adoption. CNT’s media strategy is customized around identifying quality users on global crypto & non-crypto sites and apps and acquire them through retargeting. While there are a multitude of options available in the market to promote, ranging from Google, Facebook, Twitter, Telegram etc, CNT is leveraging their direct publisher & network relationships built over last one decade to acquire new users outside of Google or Facebook. The CNT platform provides extensive targeting & reporting options based on Country / State / City / Carriers / IP Ranges / Lat-Long/ OS / OS Versions / Domain URL / Bundle Ids / Device Identifiers. The CNT platform also supports cookie sync and device id-based retargeting through the use of 1st party and 3rd party data. What more, their seasoned team of experts work with you 24×7 to help set up your campaigns, recommend the optimization needed to your campaigns and open up new possibilities to acquire users. Why choose Coins and Tokens? This is a promotional press release, which contains forward-looking statements, and should be treated as advertising or promotional material. Coin Scenario does not endorse nor support this product/service. CoinScenario.com is not responsible for or liable for any content, accuracy or quality within the press release.